The 2000R-800 is the new version of 2000-800 with a USB 2.0 HighSpeed interface. The portable A6 2000R-800 is a card scanner which interfaces to any standard USB port. 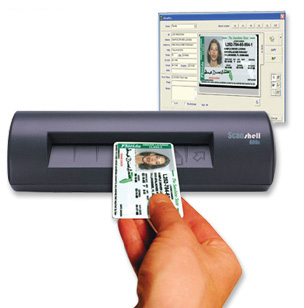 It is the scanning solution of Photo, Business Card, Bank Check, ID card (image only) and driving License. The ideal compact design and scanning quality makes it a perfect companion for your computer facility. Using your twain compliant software, you can save and keep the image of Bank Check, ID Card, and Photo quickly and clearly. The 2000R-800 is ROHS compliant. The bundled software is a powerful modular package that scans a variety of personal cards such as driver licenses, ID cards, medical insurance cards, passports, visit cards etc., as well as checks and photos into a powerful database. The software is capable of reading the card printed information from both sides, as well as barcode and magnetic strip data. It provides you with the card image and data, arranged in appropriate text fields of a powerful and flexible database. The data and images can be sorted, retrieved according to various search criteria, printed in various formats, and easily and automatically exported to any other application, email, FTP and the web. In addition, the database is packed with advanced features, allowing you to add notes and categories, automate processes, and fully customize the application.